Breathable, lightweight materials define a water-resistant Chelsea boot featuring OrthoLite arch support for all-day comfort. Style Name: Clarks Clarkdale Gobi Chelsea Boot (Men). Style Number: 5685179. Available in stores. Not enough men choose to wear ankle boots, are you going to be one of them? Find out why and how on Fashiola. Men’s Chelsea Boots are hands-down one of the most attractive looks – so why don’t more men wear them? 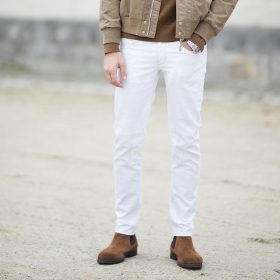 Chelsea boots are not limited to being worn with a pair of skinny jeans either, straight leg jeans or chinos are perfectly fine to combine with some Chelsea boots. If you want to make your look more casual out, swap out the traditional leather look for some suede – if you’re brave enough to wear them throughout the winter, you’re perfect for the style.